Yesterday we shared the exciting news: Redbooth is releasing a desktop app. 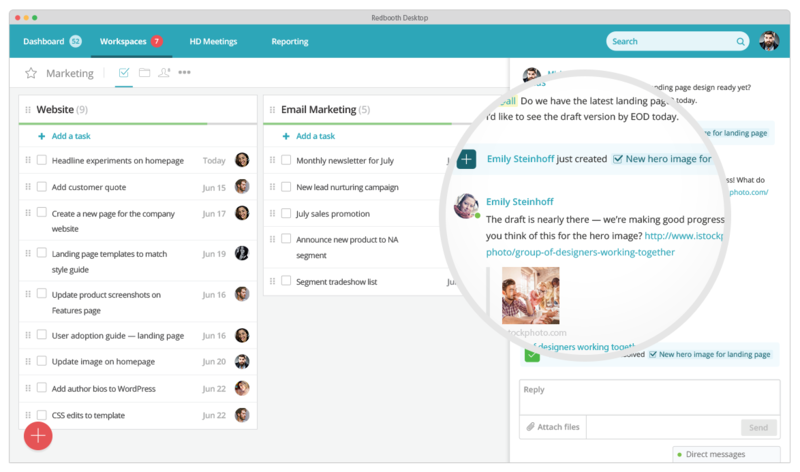 Slack, the growing and highly valued team communication app, has won favor for its desktop clients at a time when people are doing so much work in browser tabs. But Redbooth has more features than Slack. You can keep track of what you and your teammates need to do and hold high-definition video calls with multiple people, as well as chat with colleagues. I’m excited about the desktop application because Redbooth is becoming more important to people’s lives. And as such, it’s being used continuously throughout the day. A lot of our customers have asked for a desktop app, and there’s one conversation in particular that really stands out. That’s what you’ll be able to do with Redbooth’s desktop application. It’s there all the time, and you never have to remember to open it. Is the desktop app different from the browser app? Will I need to re-train my team on it? We designed the desktop app so that it looks and feels exactly the same as the browser version — so there should not be any adaptation or learning curve. If your team is using an old web browser (as some IT departments require for security reasons), they’re likely to notice an improvement in their Redbooth experience after switching to the desktop version. Is it complicated to implement the desktop app from a technical perspective? It’s very simple to use. You can easily set up the desktop app so that when you turn on your computer in the morning, Redbooth automatically runs. The app will also update automatically so that you’re always running the most recent version. You can use it on Mac, Windows, and Linux. How will using the desktop app affect my team’s productivity? It’s possible that you’ll see even better results than you get with Redbooth in your browser. You’re eliminating all of the distractions that come with having other browser tabs and windows around it. You can just focus on why you came to Redbooth in the first place: to drive better communication and collaboration for your business. Who has access to the desktop app now? Can I get access? Right now, it is for current customers. We’ve invited a small group to a limited beta. The program will run for four weeks.